Ohhh I have a Sleep Sheep but that thing looks pretty awesome!!! I got this and the sleep sheep at the same time. Elise doesn't seem very interested in it. I didn't know it shows real constellations though. Interesting! This is the one thing on my registry I'm most excited about. I'm glad you and Miloh love it! 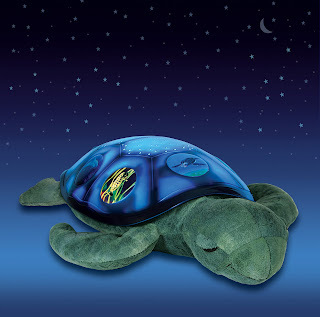 We have this same turtle. I Love it. Except its out of batteries right now. Its nicer to look at than a regular night lite. We have both though cause I feel bad for Milo when he wakes up and the room is pitch black. I love looking at the constellations and trying to figure them out! another great baby item for getting them to go to bed is the fisher price lullaby seahorse. 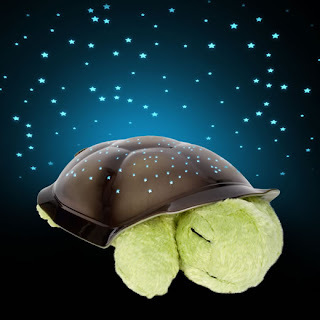 it's cheap and babies adore it, plus the thing glows like the glowworms we had as kids- so when you take it in the car, you can use it as a nightlight to check on them in the dark. bonus!